Dan and I took a trip to Boston last night. Not literally--in truth, we only drove down to Annapolis to hear Peter Mulvey and Kris Delmhorst at the Ram's Head. But as soon as Peter started playing his guitar with the bass string tuned way down low, his finger flying, his head back and his eyes closed, as soon as he opened his mouth to sing, we were back in Boston. As I've written before, different times of life have their soundtrack, and so do different places. Boston's melody line is sung by a band of young, folk-ish singer-songwriters who find plenty of performance spaces, not just in clubs and coffeehouses, but on the street corners in Harvard Square and on just about any subway platform. The church I served in Somerville, MA, had a coffee house the first Friday of every month. The hour before the featured performer was open mike, and if you could stand sitting through it, you could hear the next Tracy Chapman back to back with a guy who sang songs he wrote ten minutes earlier accompanied by his boom box. Peter Mulvey played at our coffeehouse one night, and since I lived in a parsonage right next door to the church, it was my job to open up for him in the late afternoon and help him set up his amps and speakers. Then he had time to kill, so he accepted my invitation for a bowl of chicken and parsnip soup with my family. He was good company, and thanked me for the soup by dedicating a love song to Dan and me that night. Even better, he remembered both me and that song, and when I'd see him playing in the subway later in the year, he would often play the song again. So last night, I wasn't really sitting in Annapolis listening to him play. I was standing on the Davis Square subway platform with a baby in a backpack and a toddler pulling on either arm, letting the train pass so I could hear one more song. It's good for me to remember how music can take us back in time, often to the sweetest parts of our past lives. This coming Sunday, we're going to sing one of my all-time least favorite hymns in worship, "Rock of Ages". The lyrics of the hymn (in my humble opinion, of course) manage to be both obscure and objectionable. The song reminds me of funeral homes, but at our Worship Task Group meeting it became clear to me that it reminded Charlie, Nan and Sandy of home. Rock of Ages isn't about being "saved from wrath" for them--the words don't really say what this song is about. It's really about church suppers with covered dishes and sheet cakes. It's about picnics at the lake and the closeness of families sitting in pews in country churches. But what if I don't have the same associations with a song that someone else does? Sometimes, the song just has to be abandoned, no matter how sweet the memories. Sometimes we can keep the tune and "fix" or change the words. But another thing we can do is share the story behind the song--not so much the story of its author, but the story of where the song takes you, the scene where you find yourself in your memory as you hear the song played. Then, we're not just sharing a song with each other. We're sharing our lives, and claiming a piece of our history as nourishment for today. Music has such power--if only we were wiser about how to use it to build community! I'm reading an incredible book right now, The Piano Tuner by Daniel Mason. It tells the story of a British doctor's work to build peace in nineteenth century colonial Burma. The story is told that this officer and his party were once ambushed in the jungle by bandits. Instead of running from the arrows being shot at him, the doctor stood still and took out a flute, and then played a simple Burmese tune. The ambush stopped, and the bandits then travelled with the party as protectors. "What was the song?" the piano tuner asks when he hears the story. The teller responds, "a Shan love ditty. When a Shan boy courts his sweetheart, he always plays the same song. It's nothing, rather simple, but it worked like a miracle. Carroll later told the soldier who told me the story that no man could kill one who played a song that reminded him of the first time he had fallen in love." There are few phrases in the English language that make me more tense than "Here's a song everyone knows!" As soon as I hear that, I am prepared to feel like a nobody because I don't know the song that everyone is about to join in on. But to my great surprise, the opposite thing happened at the Second Saturday show at KC this past Saturday. Ron Holloway brought up Meritxell Negre, a singer from Barcelona, Spain, together they performed a couple of Negre's original compositions (beautiful, by the way). Then the singer said, "Here's a song everyone knows. Absolutely everyone knows this one!" I braced myself, but then immediately recognized the opening chords to "Give Me One Reason" by Tracy Chapman. It's on Chapman's album "New Beginning", released in 1995, the year my twins were born, a year when we spent a lot of time inside, listening to music. I remember the song well and Dan and I sang our hearts out Saturday night. When the song was over, I could hear people at the tables behind us and across from us asking each other, "What song was that? Who wrote it? Tracy who?" Funny, I thought everyone knew it. Music is so generationally identified in our culture that it is very hard to find songs that "everyone knows" in a group that has even a little bit of an age mix. This is probably even more true in churches today than ever. Songs that people my age sang in summer camp or at Intervarsity meetings in college are considered "new" to people who grew up singing traditional hymns, but they seem so dated to me it's hard to muster the energy to fight for the inclusion of these "new" songs. But if we sing only music written 50 years ago or earlier, worship starts to feel a bit musty and nostalgic to me. What's the solution? How can we find music to sing together as a community? Well, last night, KC began a 12-week experiment with a possible solution. Jason Reed, our new Walden B. Howard Musician in Residence, says that he is going to help us write our own music--words, vocals, accompaniment, the whole thing. About ten of us (ranging in age from 70's to 8 years old) gathered in Iris' dining room last night with three guitars, one bassoon, one violin, one piano, a hand drum and two maracas. Believe it or not, we composed a song. It was hard to believe it would work, but it kind of did. It's a process that I think we'll get better at as time goes on (if Jason has the fortitude to do this again). I'm hopeful that somehow in all the racket we made, we stepped into a new future for our church, singing our own songs, songs that until now, nobody knew. Over winter vacation, I managed to avoid seeing "Alvin and the Chipmunks" but I did see just about every other kid movie that is currently out. In fact, I've seen probably 75% of all kids movies released over the past 4 or 5 years. I'm not whining about this either, although some of them have been truly terrible. I do occasionally look around the theater at these movies and wonder at the adults who seem to have willinging gone to a kids' movie without any kids with them. But who knows, I may be one of them in a few years, because even when these movies have weak plots and mediocre acting, they often address important personal and social issues in creative, accessible ways. I've been impressed, in particular, by how many of these movies deal with questions around the use of force and the potential for creative problem solving. I was absolutely entralled with the Fantasic Four sequel out this past summer, Rise of the Silver Surfer, and talked about it to anyone who would listen to the great embarrassment of my kids (who still haven't forgiven me for asking the people near me in the theater if they wanted to talk about the theological questions raised by Batman Begins ). Over Christmas break I completely enjoyed "National Treasure 2: Book of Secrets" in large part because of the message it communicated about our failed strategy in Iraq. Okay, I know this sounds like a stretch. But hear me out. Throughout this movie, Nicholas Cage is trying to solve a puzzle in order to prove to the world that his grandfather was not involved with the assassination of Abraham Lincoln. In the course of following a series of really obscure clues which only he could trace, he realizes that he is being followed by a bad guy who wants the treasure at the end of his search. The bad guy has a gun, unlike Nicholas Cage, and whenever things get confusing or difficult, he resorts to violence or the treat of violence to solve the problem. But in this movie, violence only ever gets in the way of solving the problem. In fact, in ends up causing many more problems. Why? Because the problem is, in the end, a puzzle, and puzzles can't be solved with a gun. Threats don't help solve them, and fear gets in the way. A puzzle-solver has no use for violence. I thought of this lesson again this morining as I was listening to another segment of NPR's series on the troop surge in Iraq, one year later. Today's story included interviews with U.S. army officers who are trying to untangle the political puzzle in Iraq. One officer was trying to open three hospitals, and he sounded almost on the verge of tears as he described his fruitless efforts to meet with an Iraqi health administrator. My heart went out to this man who knows better than most of us the limits of what can be solved with force and the threat of violence. Clearly, what Iraq needs is a Nicolas Cage-style puzzle solver--someone who has the depth of knowledge of history and relationships and the personal delicacy and the doggedness it takes to solve a really complex puzzles. My guess is that person would be an Iraqi, but perhaps he or she would benefit from a partnership with an international team of puzzle solvers. Maybe there are kids now who will grow up to be those puzzle masters--but they will need a lot more nudges, a lot more coaching than one entertaining movie can provide. 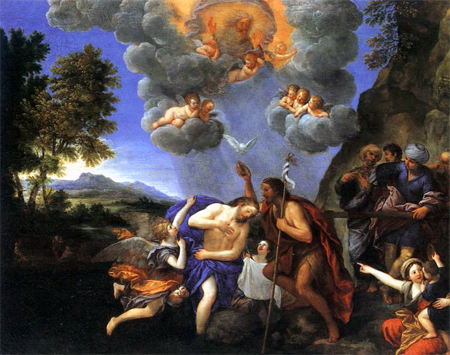 This second week of Epiphany week we remember the Baptism of Jesus. It is difficult (maybe impossible) to try and apply any sort of chronological coherence to the lectionary readings—last week Jesus was a toddler and in three weeks he begins his journey toward Jerusalem and his crucifixion! Nevertheless, this week we find John Baptizing Jesus. Now, you don’t need us to emphasize that this is an Important Moment. As we read the scripture in Matthew (and even if we compare it to how the story unfolds in the other gospels) we can see that this is the event that propels Jesus in to his official public ministry. Before this all we really know of him through the scripture is that (assuming you were listening to Heather’s Story for All Ages last Sunday) Jesus was growing up and had been found in the temple impressing rabbis. His Baptism is the moment that it all begins. Before there was a lot of rumor and assumption and conjecture, but this is where Jesus is Affirmed and Named and Ordained by God. There is a lot of potency in this moment. Even within this scene of Baptism expectation continues to mount as the water rushes by John and Jesus (and whomever else might be standing around). John had been publicly talking and dreaming about Jesus. He had been laying the path for Jesus--Preparing the Way. Today the Eastern Orthodox Church still refers to John as St. John the Forerunner —he was the one who came before the One who was to come. We do not know from this text if Jesus and John knew one another before hand. It is fun to assume that they did since their mothers were relatives and both boys were the result of some Divine Intervetion. It is fun to assume they grew up together and learned Torah together and knew which one ran the fastest and which one sung the best. But when Jesus shows up at the Jordan where crowds from Jerusalem have gathered for Baptism John protests. John is Baptizing for Repentance, an important concept in the return to covenant relationship with Yahweh. John seems to believe he is not worthy to Baptize Jesus or that Jesus does not need this Baptism of Repentence. He seems to believe there is something in Jesus that is more holy or more worthy or more important than he is and he (John) should not participate and need not facilitate it. Why would he think this? What was he expecting? Well, as we look at the passages this week in Isaiah and the Psalm we are reminded of the high standards and expectations folks had for what qualities and abilities the messiah would possess. In Isaiah, we see described a leader that brings justice to the nations, has great endurance to accomplish these tasks, and is gentle and humble as he accomplishes these things. In response to John’s protest, Jesus even answers, “Let it be so for now; for it is proper for us in this way to fulfill all righteousness (NRSV).” Isaiah describes a just leader, one whom God has called in righteousness. Again, this is not a Small Moment. In our culture it is easy for us to become calloused to hearing accounts of people with whom God has spoken. Any of us can quickly find a book or a television show where someone relates a personal interaction with God. And this causes a primary difficulty in our understanding of scripture today. In our view, we have become too familiar and friendly and flippant about God and our possible interaction with the Creator of All that Is. In Matthew it says the Spirit of God descended on Jesus and a Voice from Heaven claimed Jesus as The Beloved. Look at the respect for God that is shown in Isaiah. Look at the respect for God shown in the Psalm this week. We see the Lord described as powerful and glorious and full of majesty and ruling over the waters and breaking the cedars and flashing forth fire and shaking the wilderness and stripping the forest bare and ruling over the flood and ruling as king forever. Throughout the Hebrew scripture and the New Testament, God’s appearances are accompanied by lighting, thunder, wind, and earthquakes. This is no Small God. The Acts passage reinforces the importance of God’s presence and intention in Jesus’ ministry. Because God ordained Jesus, because God chose certain people to witness the resurrection, those people are charged with going and teaching about Jesus’ purpose, “that everyone who believes in him receives forgiveness of sins through his name.” This sort of turns John’s Baptism of Repentance on its ear…forgiveness is through Jesus and his teachings and is available to anyone (not just the Jews) who believe in him--covenant is recovered and restored and made whole through Jesus. Those who stood in the river and witnessed this Baptism Witnessed a Sea Change. Jesus was called, responded, was baptized, was blessed / ordained, and then went forward with his ministry from that place. To our knowledge, he did not have to finish a class or fill out a workbook to qualify to be Baptized. To our knowledge, he did not have to fill out any sort of form guaranteeing what he would accomplish after his Baptism. He was Called and he Responded. At his response he was affirmed in who he was and what he was doing. Then he launched out in to the world to do the work that he felt called to do. Did he know that after this he would be sent in to the wilderness and tempted? Did he know at this time that it would all end up in brutal death and crucifixion? According to scripture there is no way we can be certain. However, we do know that he felt a Calling on his life, he Responded, and his Response was met with Love and Affirmation. +As Ada asked us in worship this past Sunday, what event or moment in time did you know you were Loved by God? +What call has God placed on your life? How have you received that call? +Where are you met with love and affirmation? How do you respond?